Astitva - Search for an Identity: Hatf IX – A warm start for Nuclear Proliferation? Hatf IX – A warm start for Nuclear Proliferation? Short range missiles are used to target - neighbouring countries, advancing enemy columns, military formations etc. 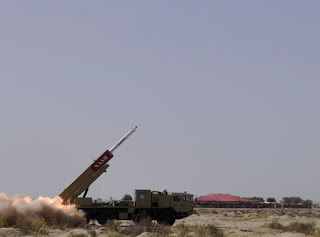 The same thing is applicable for Pakistan's new short range missile - Hatf IX NASR too, which, according to Pakistan's claims, successfully test fired on April 19, 2011. What make this missile interesting is its nuclear delivery capability and short range. With a range as low as 60km; this surface to surface, multi tube ballistic missile can cover a distance equivalent to that of a bus in one hour (if it is travelling at a speed of 60kph). Because of its short range it can only target neighbouring countries and cities close to its border, apart from the advancing conventional enemy formations. And who are these neighbours of Pakistan? - Afghanistan, Iran, India, China and Tajikistan. The question of who is the target is irrelevant to a person who knows (/lives) something about the geopolitics of South Asia. The main problem with this missile is its nuclear delivery capability over a short range. Hatf IX NASR can carry, low yield (less than one kiloton) nuclear war heads. This is believed to be Pakistan’s answer for India's ‘Cold Start’ war doctrine. If this shadow boxing is limited to doctrinal level then it was ok, but unfortunately this may not be the case. Hatf IX is a multi tube ballistic missile which can be launched form a Transporter Erector Launcher (TEL), which can in turn carry two missiles at a time. For effective use at the time of war, this missile has to be in the battle field. Even in the absence of war, this missile can’t be far from Pakistan’s eastern border, as it is designed for a quick answer to India's Cold Start limited war doctrine. This may act as an effective deterrent against a limited war as Pakistan says and likes; but in the battle field situation, who will determine when to fire? What will happen if officers in the battlefield overruled Military Head Quarters and fired the missiles with nuclear war head? Just imagine a PNS Meharan style coordinated terrorist attack (lasted for more than 10 hours and the insurgents were able to destroy two PC3-Orion aircraft) in the army bases were the Hatf IX NASR is deployed. Won’t they get more than enough time to launch the rocket? And nobody can guarantee that they will target only the institutions in Pakistan. Moreover even if it is launched by Pakistani regulars, the results will not be good. Border cities in India are heavily populated and the after effects of nuclear pollution are severe, as the range is small this will affect Pakistan also. These types of missiles will definitely lead to the miniaturization of atomic bombs which in turn not only increase the risk but also help in its proliferation; just imagine the situation, where the terrorist are playing with miniaturized atom bombs as they are doing now with Kalashnikov rifles. Today desperate Gaddafi may not be able to launch a coordinate attack against NATO’s fighter formations, but tomorrow NATO may be welcomed by sub kiloton Plutonium bombs. At this point it is good for the both nations (India and Pakistan) to concentrate on talks, even if it didn’t produce any results, at least it may establish a contact between them. For Pakistan, it is better to invest these huge amounts in infrastructure development, education, other necessities and go against domestic terrorists which killed more Pakistanis than all the wars with India combined.